Varicose veins are abnormally widened and twisted veins in the leg. Although any vein in the body can be affected in this way, it is mainly the leg veins that are involved in most people. Varicose veins is one of the most common leg vein problems and it involves the superficial veins of the leg. The other common leg vein problem is deep vein thrombosis (DVT) which involves the deep veins of the leg. Both conditions are however, interrelated in that varicose veins can increase the chances of deep vein thrombosis. The veins return blood to the heart where it can then be sent to the lungs for re-oxygenation. Blood from the feet and legs have to travel the furthest compared to any other part of the body. The blood from the feet and lower legs drains into the superficial veins of the leg and then into the deep veins. Since blood has to travel up the legs, against the action of gravity, the veins have a special mechanism to help it flow. Valves in the leg veins allow blood to flow in one direction only – from the feet to the heart. Blood is gradually pushed upwards when the muscles in the feet and legs contract during activity. Backward flow is prevented by the closing of the valves. With smaller veins known as spider veins around the larger veins. Heavy aching feeling of the legs. Burning muscle pain or cramps. Skin ulcers usually near the ankle. Varicose veins are usually painless but pain can develop with more severe cases especially when sitting or standing for long periods. Ulcers that form with varicose veins are very painful. Sometimes the pain may be associated with deep vein thrombosis (DVT). Walking around after standing or sitting for long periods. Elevating the legs when sitting for long periods. Compression stockings are widely used for varicose veins and are a very effective option. 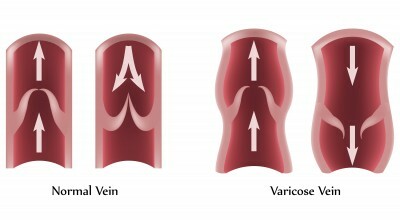 It applies pressure from the exterior on the leg veins. These stockings are available in different compression gradients so that the amount of pressure can be selected as is required. Destroys the vein with a sclerosing agent, laser and heat – sclerotherapy, simple laser (surface) or endovenous laser treatment (catheter-assisted) and radiofrequency ablation. Removes the vein – ligation and stripping, ambulatory phlebectomy and endoscopic vein surgery.